The President had his say last evening. If I had the privilege, what would I say to the country? Because that thought only came to me yesterday, I haven’t begun to write such a speech. I read a would-be declaration by Jim Beaver, an actor and former Marine. Perhaps he borrowed it. He offers 16 points. Following his lead (and some of his statements) I will write my own domestic agenda. The list does not address our country’s relationship to other countries. Perhaps I can list those preference tomorrow. A country should take care of its weakest members. A country cannot call itself civilized when its children, disabled, sick, and elderly are neglected. Healthcare is a right, not a privilege. I believe healthcare should be far cheaper than it is, and that everyone should have access to it. Education should be affordable and accessible to everyone. Companies should be required to pay their employees a decent, livable wage. Religious dogma and mores should not be forced on people. Women should not be treated as a separate class of human. They should be paid the same as men who do the same work, should have the same rights as men and should be free from abuse. LGBT people should have the *same* rights that I have. Systemic racism and misogyny in our society are much worse than many people think, and desperately need to be addressed. I favor social politeness. If call you Dave and you say you prefer to be called David I’ll call you David. It’s the polite thing to do. As Maya Angelou put it, when we know better, we do better. When someone tells you that a term or phrase is more accurate/less hurtful than the one you’re using, you now know better. The government should regulate against environmental destruction, tainted food/water, unsafe materials in consumable goods or medical equipment. I believe in sensible restrictions to gun ownership. Isupport the funding of sustainable energy, including offering education to people currently working in coal or oil so they can change jobs. Of course, you may write a rebuttal. You read me; i will read you. The newspaper reminds us of the 1978 blizzard that dumped 24 inches of snow on Indianapolis (and even more on Goshen). To our children’s great disappointment, we missed out. We lived in Costa Rica that year. We’ve not seen a blizzard in many years. Last year we received flurries only. Never once did I use the snow blower. This year we experienced a very cold two weeks in January and received enough snow to get out the snow blower twice. On the bench outside her front door, 90-year-old Shirley placed a paper bag labelled “Dan.” In it were “dunkin’ cookies,” her sweet way of saying thanks for de-icing her car windows. The pie safe smelled of onions, but no onions were in it. Finally the culprit revealed itself — a wooden salad bowl that I hadn’t sufficiently cleaned. Undoubtedly the important #metoo moment raises anxieties among those males who have not as yet been identified as sexual predators. I wish we saw the variety of birds that visit Lali and Doug’s bird feeders. Here we seem limited to cardinals and sparrows in the winter. A highly valued Christmas present — No Time to Spare by Ursula K. Le Guin, published in 2017. She died this past week. Several jigsaw puzzle enthusiasts at Landis Homes in Lititz, Pennsylvania asked to use a photo of hoarfrost on gingko leaves for the making of a puzzle. They’ve got a web maker to do it for them. The New York Times might be anathema to Donald Trump, but I found this week’s Sunday Review to be powerfully cognizant of this era and its issues. Our modest house supplies us with two meditation centers — one in the sun room, the other in front of the fire place. At the end of this week I shall see friends at Mennonite Arts Weekend in Cincinnati; in two weeks friends at Rebecca Stoltzfus’ inauguration as president of Goshen College. These events stir a desire to go to Lancaster to see old time friends. Donald Swarr’s death gives me strong motivation to make the trip. A three-day weekend car rental from Enterprise will cost me about $47. Were I to make such a rental in August, the price would be more than triple. Oh, the difference between jeans measuring 36 x 29 and those measuring 34 x 29. During the first days of January, four of our family were in Guatemala — Gretchen, Ben, Sam and Ingrid. Ben is now in Madrid for a college term. Courtney will soon travel to the Caribbean. I learn that Ingrid has been invited to lecture in India in August. Meanwhile Adrian is here with us during an internship with Young Actors Guild. We come and go. “Philip Roth Is Still Here” is the title of an interview with the renowned novelist Philip Roth, appearing in the January 21 2018 Book Review of The New York Times. The interviewer was Charles McGrath, a former editor of the Book Review and a contributing writer for The Times. I have interviewed Roth on several occasions over the years, and last month I asked if we could talk again. Like a lot of his readers, I wondered what the author of “American Pastoral,” “I Married a Communist” and “The Plot Against America” made of this strange period we are living in now. And I was curious about how he spent his time. Sudoku? Daytime TV? He agreed to be interviewed but only if it could be done via email. He needed to take some time, he said, and think about what he wanted to say. Yes, in just a matter of months I’ll depart old age to enter deep old age — easing ever deeper daily into the redoubtable Valley of the Shadow. Right now it is astonishing to find myself still here at the end of each day. Getting into bed at night I smile and think, “I lived another day.” And then it’s astonishing again to awaken eight hour later and to see that it is morning of the net day and that I continue to be here. “I survived another,” which thought causes me to smile once more. I go to sleep smiling and I wake up smiling. I’m very pleased that I’m still alive. Moreover, when this happens, as it has, week after week and month after month since I began drawing Social Security, it produces the illusion that this thing is just never going to end, though of course I know that it can stop on a dime. It’s something like playing a game, day in and day out, a high-stakes game that for now, even against the odds, I just keep winning. We will see how long my luck holds out. Roth expresses my own emotions and thoughts, even though I’m only 80. The longer I live the more I experience the passing of contemporaries that I worked and played with, loved and lived with. While all of us in our 80s and 90s know that death is near at hand, the news of any one person’s death is a shock. Today I grieve the passing of Donald Swarr, a grade school friend in Landisville, PA. Here is a photo and part of the obit. I liked Donald very much in school. His kindness and gentleness bespoke a non-threatening presence. At that time I was ignorant of homosexuality, yet I was quietly grateful that no one teased Donald for his feminine demeanor. Recently we received notice that The Indianapolis Star will now cost $50 per month. This bit of news has pushed me to the edge; I favor dropping our subscription. The Indianapolis Star was founded in 1903 by Muncie industrialist George F. McCulloch as competition to two other Indianapolis dailies, the Indianapolis Journal and the Indianapolis Sentinel. Eugene Pulliam purchased The Star in 1944 and another paper in 1948, the other leading paper of the time, Indianapolis News, and combined the business operations. In 2000 the company was sold to Gannet Company Inc., a publicly traded American media holding company. It is the largest U.S. newspaper publisher as measured by total daily circulation. Its assets include the national newspaper USA Today. According to a Wikipedia report, Gannett’s largest non-national newspaper is The Arizona Republic. The same article, in listing its other significant papers, names as the first one The Indianapolis Star. Advertising, the life blood of a daily newspaper, has been moving to the plethora of other carriers, including social media — tough news for the printed paper. The Star should be a good daily, but it has lost much of its quality in the 18 years since Gannett took over. I can’t blame Gannett even though I regret the concentration of business enterprises, and especially of public service operations. To be sure, The Star does occasional exemplary work. For example it is the newspaper that first investigated allegations that Dr. Larry Nassar was sexually violating gymnasts. But typically, such as yesterday, the morning read is shallow. The paper, for example, came in five sections. Four of the section originate in Indianapolis. Here is a rough summary of the Indy sections. The other section comes from Gannett’s USA Today. Now four pages, down from eight pages six months ago. The articles are abbreviated summaries of more extensive investigations. Thursday,s paper more than doubles in size because of weekender ads. Sunday’s paper bulges with ads. Newspaper delivery has degenerated. For years the paper was placed on our porch. Then about three years ago, the deliverer threw it out the window onto the sidewalk. Sometimes I find it on the street. Here is my prediction: in two years The Indianapolis Star will not publish a seven-issues-per-week newspaper. This time of year we remember Jared, our nephew who died at 29 years of age. This weekend he will be remembered at Lehigh University. Here is an article related to the LU remembrance. January 22-28 is Coaches vs. Cancer Suits and Sneakers Week, a nationwide collaboration between the American Cancer Society and the National Association of Basketball Coaches (NABC) to increase cancer awareness and promote healthy living through awareness efforts, fundraising activities and advocacy programs. The cause hits close to home for the Lehigh Men’s Basketball program, who lost one of its own at just 29 years old. Jared Hess’ legacy will be remembered prior to this Saturday’s 7 p.m. game vs. Navy, on what would have been his 40th birthday, with Hess’ family expected to be in attendance. 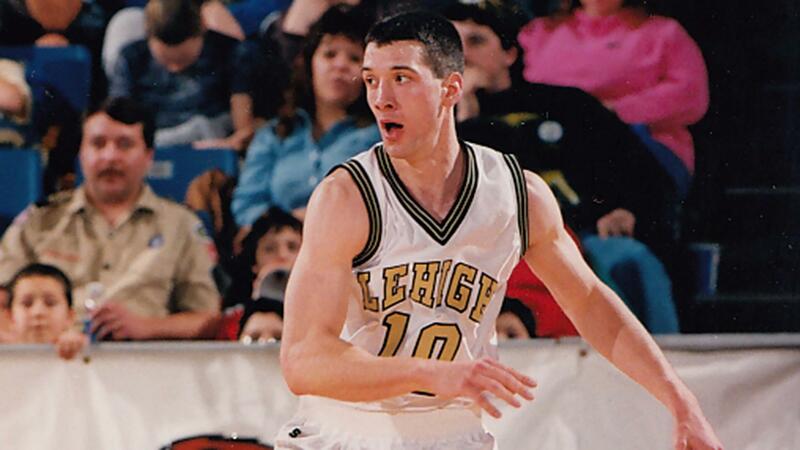 Ten years ago today, on January 25, 2008, the Lehigh men’s basketball lost one of its own when Jared Hess ’00 succumbed to leukemia (blood cancer). Hess is gone, but certainly not forgotten. As a way to remember her husband, Jared’s widow Anne has often brought their two boys, Caleb and Noah, back to Lehigh basketball games as a way to keep his memory alive. Hess was diagnosed with leukemia on May 14, 2007 and passed away eight months later, just two days before his 30th birthday. This coming Saturday (Jan. 27) would have been his 40th birthday. The diagnosis came out of the blue, especially for an otherwise healthy 29-year old former collegiate athlete. “He just felt like he had the flu. It went on for weeks and he couldn’t shake it,” said Anne. “The hospital was really surprised that he was doing as well as he was. I think it’s a testament to how strong and healthy he was in every other aspect. When he went to the doctor, they said he needed to go to the hospital right away because his white blood cell counts were very elevated. To say the news was a shock would be an understatement. At the time of diagnosis, Jared and Anne had one son, Caleb, who was one and a half years old, with another son on the way. Approximately four months after Jared’s diagnosis, Noah was born. “For Jared, he was very much focused on what he could do to make sure he was here for the boys and for Anne,” said Christine. “Being sick was frustrating for him because he had to spend a lot of time in the hospital and couldn’t be home as much as he wanted,” said Anne. “But he faced it. As difficult as it was, he faced it with a lot of courage and I did the same. Two memorial services were held for Jared, both in Philadelphia and Cincinnati (where he grew up and his parents still live today). Throughout his 29 years, Jared was someone who brought people together, an aspect of his life that came up often at his services. Jared was a unifier even before his time at Lehigh. Bringing people together was part of who he was. On the basketball court, Hess was an All-League player, earning second team laurels in 1999-00. He finished his career with 1,139 points, which still stands 25th in school history. During Hess’ tenure, Lehigh struggled in wins and losses, but Hess was that person who kept his team focused on its goals and aspirations. Hess’ impact proved tangible when his junior year, the Mountain Hawks were 0-12 in Patriot League play and the season could have gone in a negative direction. Instead, Hess helped orchestrate a 53-45 Patriot League Tournament upset of second-seeded and defending champion Navy. Hess scored a game-high 20 points. Hess is gone, but certainly not forgotten. He left many great memories on the basketball court, but his impact off the court is what people will remember most. Time has passed, but those memories have not diminished. Hess’ impact is lasting. Those conversations are one of many ways to keep Jared’s memory alive. Other ways are to recognize Hess’ birthday (Jan. 27) and the day he was taken from us all too soon (Jan. 25). “Most years, we try to make it up to Lehigh around Jared’s birthday,” said Anne. “There’s always a game in conjunction with remembering his birthday every year and oftentimes, it’s the Coaches vs. Cancer Suits and Sneakers week. Jared’s parents and sister also remember him with a 24-hour memorial candle. The candle extinguishes itself, but Jared’s memory lives on. In quiet moments I reminisce. As I reconstruct memories, I become aware of changes that have occurred in my lifetime. Here are just five of many. As children, we would gaze into the sky and see the big and little dippers. Today telescopes and space stations allow us to see far beyond The Milky Way. We hear estimates of the existence of 100 million galaxies. When a child, going to Lancaster (seven miles away) was a trip. A car with 100,000 miles was something to take a picture of. Today we drive more than 25,000 miles per year. A trip is going to Thailand or Chile or Malta. My immediate family (children and grandchildren) live in Indiana, Massachusetts, North Carolina, Ohio, Utah, Vermont and Spain. While life in bygone eras was consumed by labor, both on the job and at home, and by a domestic culture involving immediate family, my era has nurtured a popular culture that is sustained by leisure, disposable income, a yen for pleasure and a vast entertainment industry. When in my youth we set a Remington typewriter onto the table at home, it was a great day. Who then would have dreamed of today’s electric circuits, vacuum tubes, wireless communication and information clouds? Today people seem to text more than they talk. In the 20th century polio, diphtheria, tuberculosis, cholera and pneumonia have largely been eradicated by science. Today the preoccupation is heart disease, cancer, Alzheimer’s disease, diabetes, and new viral epidemics. We 80 year olds — well, most of us — are grateful for living long enough to experience the change as we can or as we wish to.